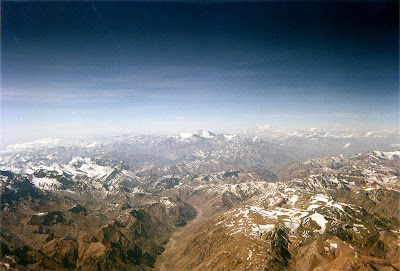 The Andes between Argentina and Chile. So guess where I am?? It's a country in South America but not Ecuador and its capital is Santiago. Unfortunately, the plane from Buenos Aires was delayed to Santiago so everyone missed their connecting flights to Ecuador and Mexico, that means that unfortunately I have to stay in Santiago tonight. I am in a 5 star hotel, supper, breakfast and mini bar are included. I am debating whether to use the gym and then go for a massage or have a massage then go to the gym then to the spa and jacuzzi or alternatively just watch films on the 40inch plasma screen in my room, which to the 'average juan' would cost $239. As you have probably guessed life is tough. Couple this with the decision I have to make regarding whether to get breakfast in bed and I think you will realise that gap year hasn't turned out as planned. It's pretty ideal actually because I don't know where TMac and TBrown are in Ecuador so this will give me a chance to find out before I actually get there. Also got a Chilean stamp in my passport which is really cool as it is a mixture of two different colours on the stamp. Good stuff. 'oink oink'. Does this mean that swine flu has hit South America and is staying in posh hotels????? That boy, he's anything but you aveage juan! And I keep oinking after each hayfeverish sneeze, but so far, nobody has got the joke. I think I am coming across as simply deranged. Must stop that. As my verification word is pleess, I can only conclude that the universe agrees. Sounds like a Condor moment for those that can remember the old tobacco adverts. I'm excited about the passport stamp. I'm very excited about the passport stamp. All I can say is lucky git! Also, like the coffee lady I am also very excited about the multicoloured passport stamp! I suspect that that boy will enjoy that kind of luck all his life! Esp. since he has a very healthy sense of humour. Hardly roughing it is he? Sounds as though that's going to be a stay to remember. He's such a naughty boy worrying his mummy with oinks. It's all very far removed from interrailing and sleeping in wet tents in Belgium, that's all i can say. I'm wondering when I get a gap year. And also coveting the stamp. He sounds like he is suffering so!